All materials will be supplied and are included in your ticket purchase. Painting a Sunset in the Sea. Join us and paint your sunset on canvas with acrylics...guided from beginning to end by artist Alicia Campos. Alicia is a psychologist, art therapist, teaching artist and a social entrepreneur, dedicated 100% to her art and teaching. She founded Happy Industries Art Studio in 2011 in New York, inspired on the one hand, by her son's artistic talents, and on the other, by the growing demand of her artwork. Alicia graduated with a BS in Psychology in Mexico D.F. and specialized in Art Therapy at Endicott College. Her main field of study was trauma in childhood. In addition, Alicia Studied a Master in Educational Technologies at Harvard, with the thesis: Art in a Hispanic Community for Social Awareness in the Age of Technology. She continued studying psychology, trauma, suicidal behaviors, art for healing and entrepreneurship. Alicia has taught Spanish grammar, literature, business and human rights at Harvard and NYU, among other universities. She is an Author/Illustrator of bilingual Spanish/English children's books: When Clotilde Dreams..., Lazaro and the Crocodile, Noah in the neighborhood and Walking through the Moon's Forest. In addition, she offers workshops and seminars to promote women entrepreneurship, the Arts and fine artists from all ages; and organizes annual Art shows, inlcluding Florida in Art. Alicia also developes/teaches Art/Spanish programs for after school programs. 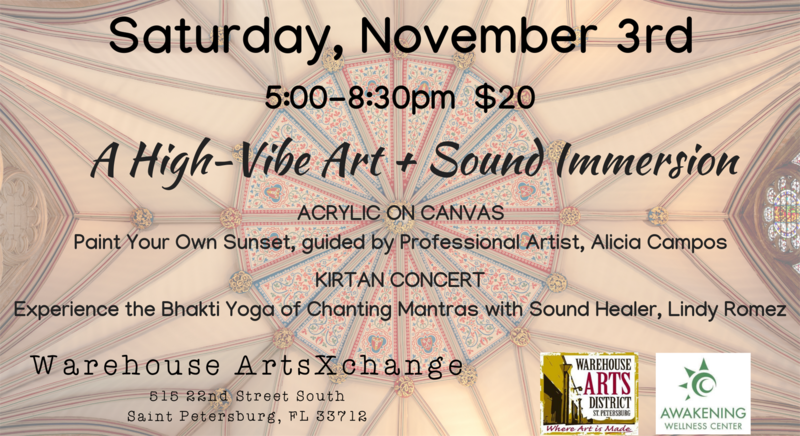 She currently is painting and teaching at her art studio in Tampa and offering local art classes and art events. A Touch of Spain Cuisine & Catering will provide a dinner option to all attendees during the session break. Cristi was born in the US, but she grew up in Madrid, Spain. Her parents were chefs and she inherited a taste for good cooking. The use of healthy ingredients is key in her cuisine. Cristi has a special love for gastronomy, gastronomy that comes from every corner of Spain. Currently, Cristi teaches cooking classes and offers catering in the Tampa Bay area. She creates a unique experience within a very Spaniard atmosphere, always having a typical Spanish “tapa” and a glass of wine from Spain, while cooking dinner with her students. All of these, of course, while listening to flamenco music and having a lot of fun! Kirtan is a very simple & powerful way to meditate. It’s effortless & joyful as you flow with the melody & rhythm. The beauty about a Kirtan “concert” is there is no separation between the one who leads the “concert” and those attending. United, both the performer(s) & the concert-goers create the experience together. Lindy leads chants both in Sanskrit and Punjabi; sacred languages used in kirtans all over the world. Without words to distract the mind, these ancient chants contain powerful, renewing & transformative energy that helps reconnect with the Divinity that resides within all of us. The magic of the chants then carry you within, becoming completely immersed in the sound. Although singing is the heart of kirtan, no one cares what you sound like. At a kirtan concert all voices merge together without ego to become One Voice. Kirtan is a means of finding our way back to the core of our Being, to our heart, and to our connection with each other and the divine. Lindy Romez is a Certified Sound Healer, Yoga & Meditation Instructor, and Reiki Master. Her passion for yoga and sound healing came after she experienced a car accident in 2000 that left her with a neck injury and paralysis down both arms. As a professional musician this was not only crippling but also devastating. Her journey into her physical recovery led her to study in India where she discovered the healing properties of sound, vibration and harmony. Being a Veteran, Lindy has been able to help other Vets with PTSD and anxiety through Tibetan Sound Bowl Healing, Reiki, Yoga and Meditation.